Want to be notified when the Catty Critic has a new post? Click to subscribe and receive email notifications. When I was an angsty teenager in Temecula, I got a job at Burger King. Somewhere in those 2 years, I stopped eating hamburgers. Maybe it was my failed effort to go “vegetarian” late Junior year or maybe it was over-exposure to frozen beef patties. Either way, I just sort of fell off the fast-food burger bandwagon, opting only to eat them from sit-down restaurants or indulge in a cheeseburger from In-n-Out on a rare occasion. Yup, In-n-Out became my one exception to my no fast-food hamburger rule. I admit, they make a pretty darn good burger but I can’t say I ever reached that fanatical level some people seem to have for the place. But they never had any competition in my book as to where to go for a great and cheap classic burger…till now. Enter into the ring Five Guys Burger & Fries. All the way from the East Coast, this franchise is expanding across the States and I have to say, after my first visit, In-n-Out could be facing its first major opponent. Husband and I decided to try out this place when we saw a sign for it while hitting up IKEA in Carson. I had seen the sign before but never really took notice until a friend mentioned them to me on FB in reply to an In-n-Out comment I had made. Husband thought that a burger sounded good for dinner and made an executive decision. 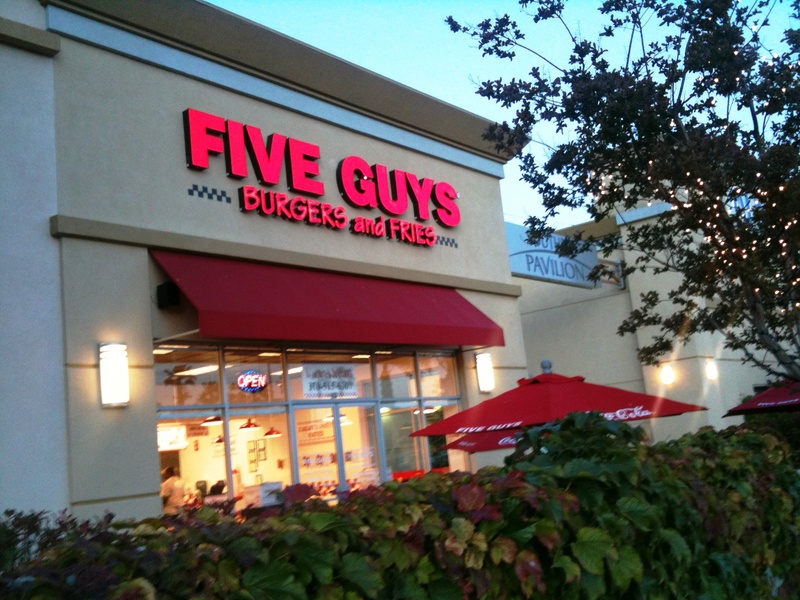 Driving around Southbay Pavilion, it turned out Five Guys was on the other side of the shopping center from where we saw the sign; it’s over by Sears. I was a little doubtful as the place looked a little empty and it was already 7pm. When I approached the door, I saw a lady walking out with a brown paper bag that had grease stains forming on the bottom. Hrm…cautiously regaining hope… When we walked in, the decor looked very In-n-Out with red and white tiles and a simple menu hanging over the registers. The dining room was about a 1/3 full but it wasn’t exactly a big space. I looked at the menu; it was divided into Burgers, Little Burgers, Dogs and Sandwiches. Turns out the Burgers are double patties while the Little Burgers are singles. The big difference I saw right off the bat…BACON. Yup, they offer up bacon hamburgers and cheeseburgers. Husband was leaping for joy, figuratively. As for the dogs, you can get a straight up Kosher dog, cheese dog, bacon dog or bacon cheese dog. I did briefly wonder why the rest of the dogs weren’t Kosher…but just for a split second. 😛 The sandwiches are the vegetarian options – veggie with or without cheese (not a veggie patty but rather, various vegetable toppings) and grilled cheese. All burgers are initially plain and there is a list of toppings you can choose from. Mayo, lettuce, ketchup, mustard, grilled or fresh onions, tomatoes, pickles, bbq sauce, jalapeno peppers, grilled mushrooms, relish, A-1 sauce or hot sauce are your choices and none of them cost extra. 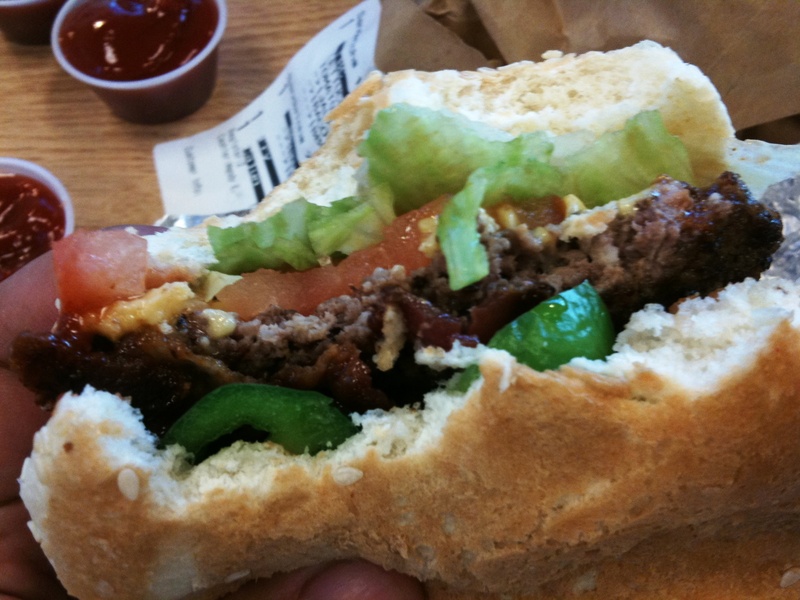 I opted for a little bacon cheeseburger with bbq sauce, jalapenos, lettuce and tomatoes. Hubby went for a bacon cheeseburger with bbq sauce. The burger was juicy and flavorful. I love the fact that sesame seed buns were used. The bacon was crispy and the ratio of toppings to burger to bun was spot on. I could taste everything without any one thing overpowering the others…well, until I bit into a jalapeno that was super hot. I ended up picking them out. I really must be losing my spicy tolerance as I get older… I think I’m going to skip the jalapenos next time and do the grilled onions. Yum. 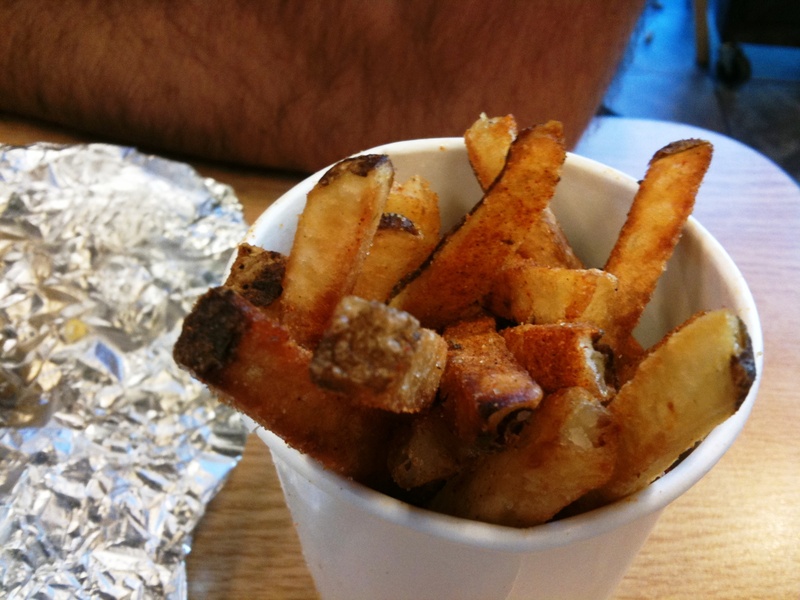 Five Guys offers two sizes of fries done two ways: Five Guys (regular) and Cajun-seasoned. Husband originally ordered a large Cajun-seasoned but the cashier told him that was big enough for 4 people. He went with the regular size. I got a regular order of regular fries which could easily be split between two people. Their fries were natural-cut and cooked in 100% peanut oil. The Cajun seasoning had a little bit of kick to it, really nice! Their regular fries were good too and I munched my bucket down to near empty. I am a french fry fiend!! Husband didn’t fare too well in making a dent in his due to the double-patty burger. He said next time, he’ll get a single so he could fit more fries in his belly. Also, they have a little board next to the fryer that states where the potatoes come from. Kinda of neat! While we were eating, more people did come in. It seems that the majority of them did to-go orders though. 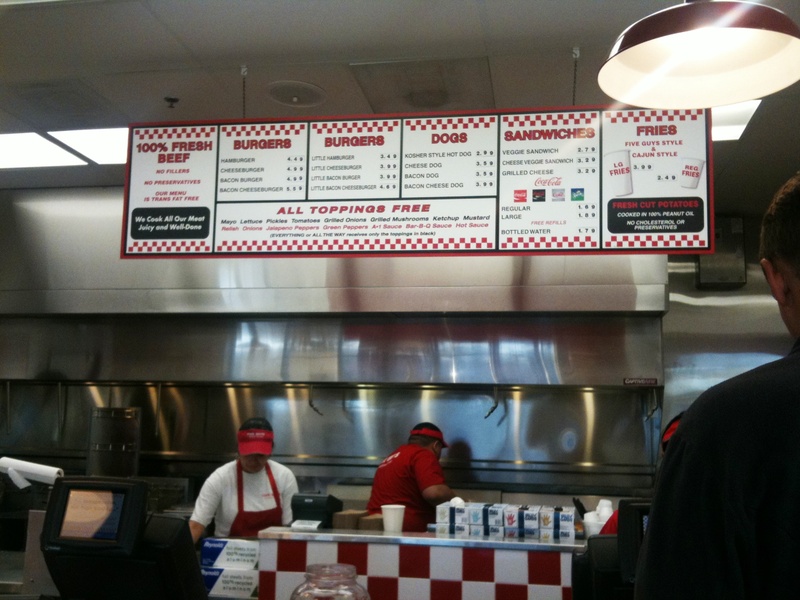 So while the dining room wasn’t crowded, business seems to be going well for Five Guys. A neat thing to note is that on the receipt taped to the bag, it numbers each burger and the burger wrappers have a sticker put on them with a number so you can tell which burger belongs to who. In case you were wondering, yes, I was doing a comparison between Five Guys and In-n-Out in my head the entire time I was nomming. 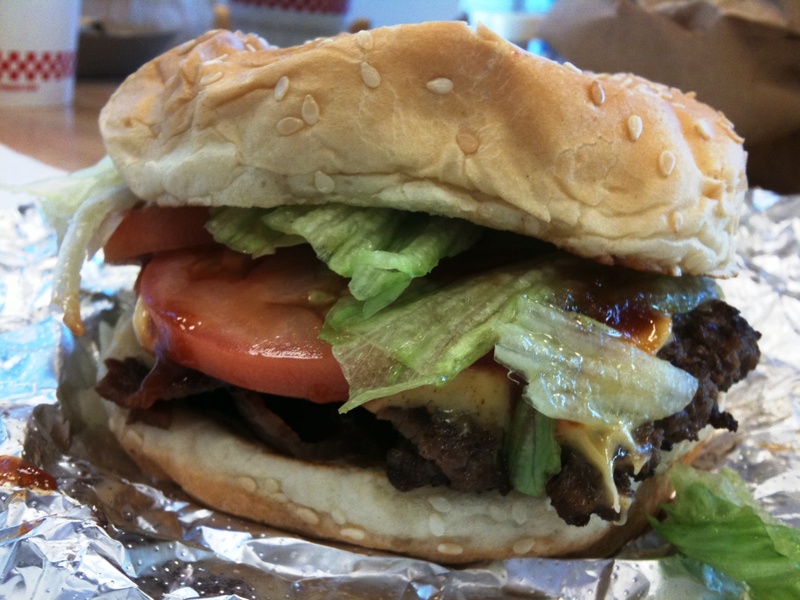 I have to say, the burger at Five Guys squeaks ahead because of the sesame bun and the bacon option. I think the burgers here are a little bigger too and have a little bit more flavor. 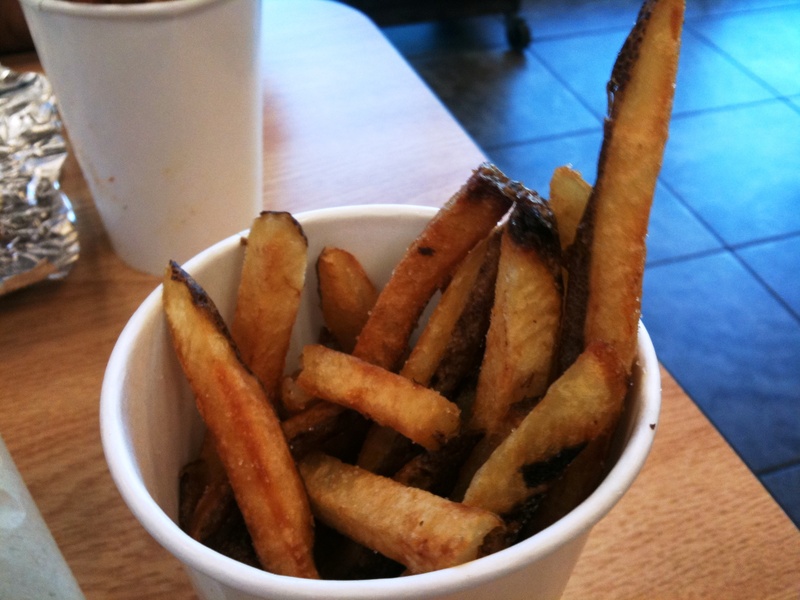 As for fries, Five Guys is way better than In-n-Out. They are cut thicker and were crisper and more cooked thru. Five Guys does lose points with me, though, for not having any shakes. Price-wise, I think the two are comparable. The Little bacon cheeseburger costs $4.69 while the double is $5.59. As for wait time, Five Guys is much better as every single In-n-Out that I have been to or driven by here in LA is always packed inside and out. I think Five Guys wins over In-n-Out. Is that blasphemy? Please don’t sic the Spanish Inquisition on me… Send it over to Husband. He can’t stand In-n-Out. 4 NOMs for Five Guys! Husband and I became avid fans of Top Chef after we caught a few episodes of Season 2. When we heard that there was going to be a Top Chef Masters, we were excited. How would some of the most renowned chefs perform, especially the ones that had previously been judges? The first season last year was my introduction to Chef Ludo Lefebvre. 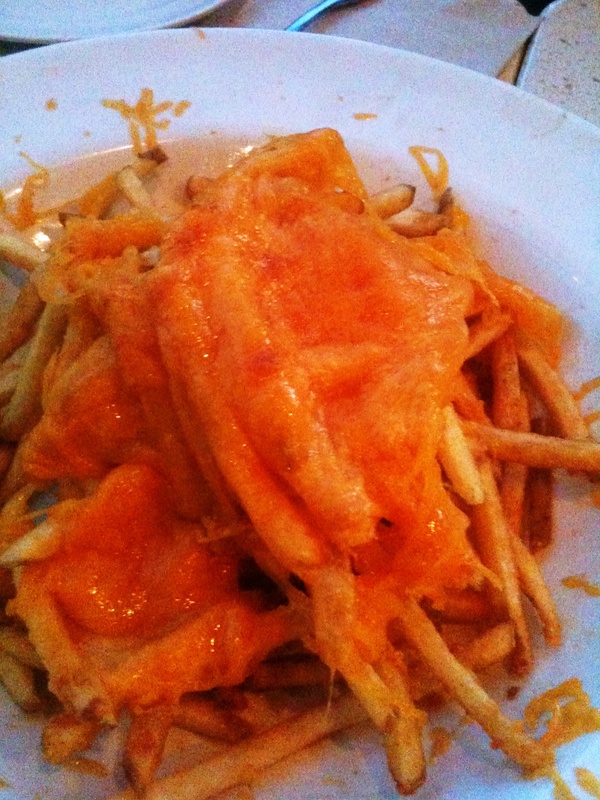 I was a little padawan foodie, learning my way around the LA food scene (still am!). I remember watching him, wondering what the hell he was saying, and getting a kick from the bickering between him and Chef Rick Moonen. 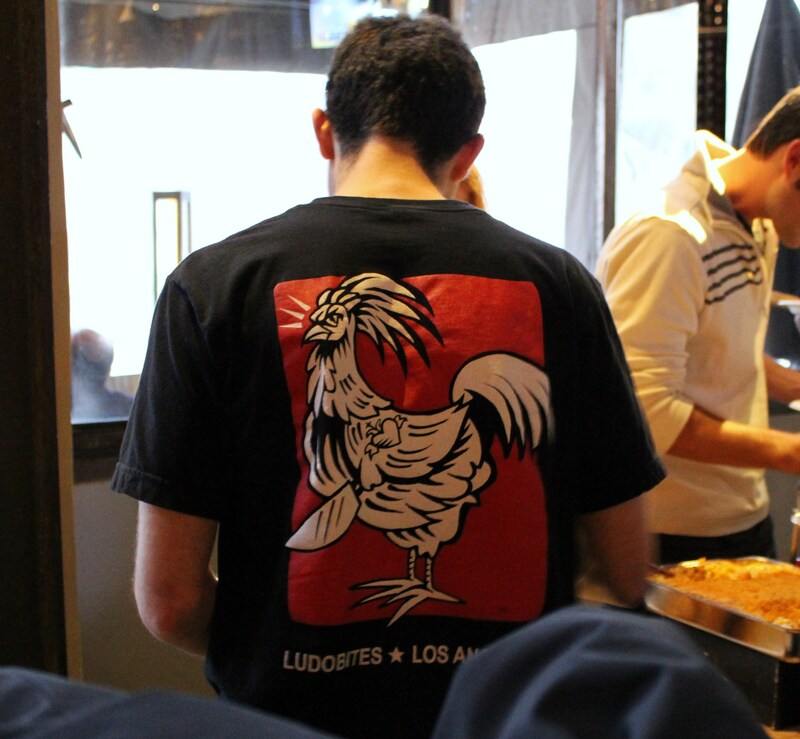 Fast forward to the last few months… I’ve since gotten a better handle on LA food and restaurants and, no surprise, Chef Ludo’s name has been popping up quite a bit with the exponentially increasing popularity of his pop-up restaurant, LudoBites as well as his LFC – Ludo Fried Chicken. Finally about to get me some Ludobites! 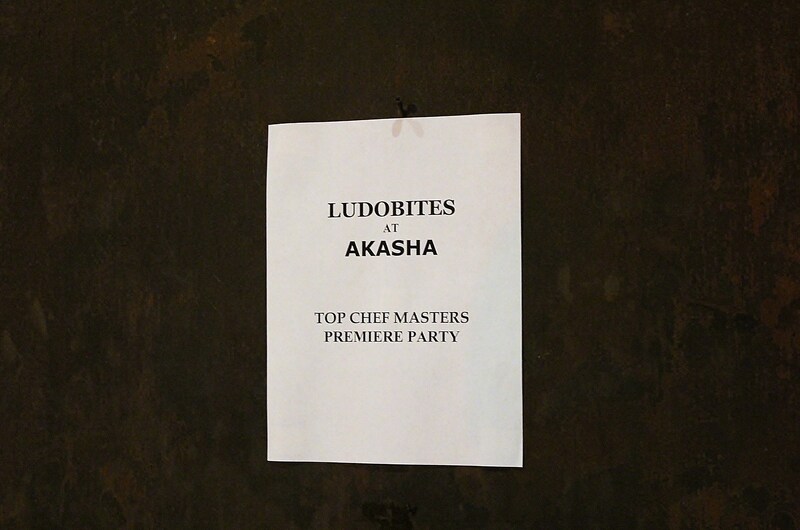 Chef Ludo returned to the 2nd season of Top Chef Masters and when the episode aired on 4/21, he threw a viewing party at Akasha in Culver City. Husband and I were there to watch all the fun as he and the other contestants, including Moonen, fought for a spot in the next round and redeem themselves. But more so, we were there to eat some LFC for the first time. Akasha is in the building that many geeks would recognize as the exterior of Flynn’s Arcade from the movie, “Tron”. Let’s just say that the interior of Akasha is about as far from an arcade as you can get. The space isn’t huge but the open contemporary floor plan makes it feel intimate yet large at the same time. I couldn’t stop staring at the extensive wine collection behind the large bar. They were still setting up the food, served buffet style. 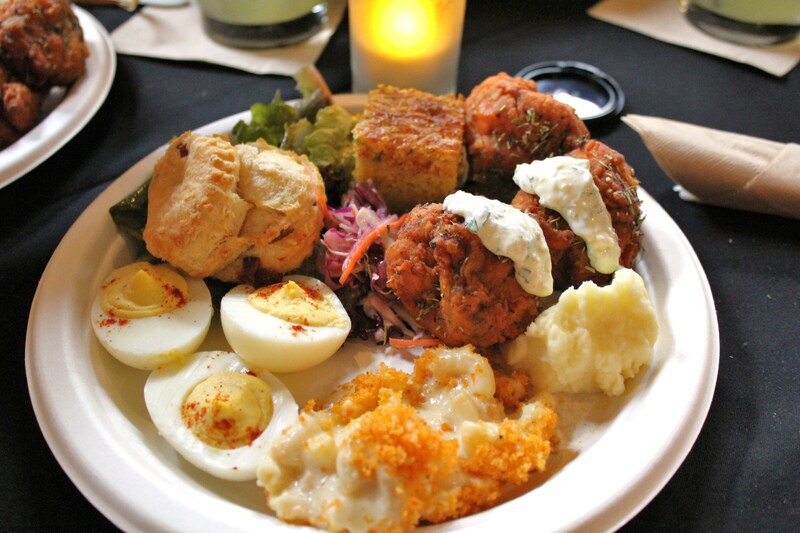 I spied a large basket of jalapeño corn bread, salad, deviled eggs, something in a large pot and biscuits. Hrm, a Southern theme… I can dig it. When everything was set up, Husband and I dug in. I grabbed a little of everything. The large pot ended up containing collard greens with black-eyed peas, not my favorite. I’m not really a bean person. There was also mac n’ cheese, a red cabbage cole slaw and mashed potatoes. The biscuits had bacon bits in it which sold Husband on them, and me, as well. The couple that loves bacon together…well, gets fat together. These were soft, fluffy; I kept having to constrain myself from going back for more. As a mac n’ cheese lover, I’m a bit picky about it. Chef Ludo made a fantastic classic version. Many other versions I’ve had never had enough cheese sauce for my liking but this wasn’t the case. And the crunchy crumbs on top is a must from a texture point of view, I think. Since they wanted to make sure everyone got some LFC, we were limited to 3 pieces. 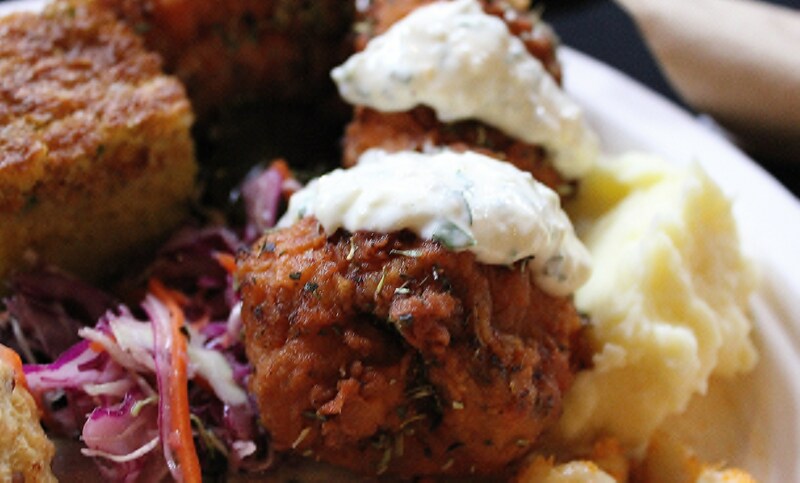 That’s okay, because these boneless fried balls of poultry were quite large. A nice amount of batter that didn’t come out too saturated in oil, the herbs really gave it a lot of flavor. Even Husband was impressed. I think I heard the words “some of the best fried chicken ever” come out of his mouth. I agree. And the lemon aoli sauce gave a nice tang to it. I can understand the hype surrounding LFC. By the time the viewing started, the place was packed with Ludo fans like this guy. It was fun watching the show with other people who were just as into it as us. While Ludo didn’t win on the show, he certainly won me and Husband over. Now I’m really sad I wasn’t able to get a reservation for LudoBites 4.0 at Gram & Papa’s…*sniff sniff* Well, there will be a LudoBites 5.0, right? For more pictures, visit my Facebook page! I’ve been on a BLT kick lately. It’s a pretty simple sandwich but when done right, can be all kinds of yum. I think what I like best about it, besides the bacon, is the crunchy texture. Toasted bread, fresh lettuce and crispy bacon all combine to give it this snap when you bite into it but it’s balanced with juicy tomatoes and mayo for moistness. On Tax Day, we took our friend, artist Tanya Bjork, and her man to The Counter in El Segundo. They had never been but had heard Husband and I sing its praises. They ended up happy with it. Another convert! 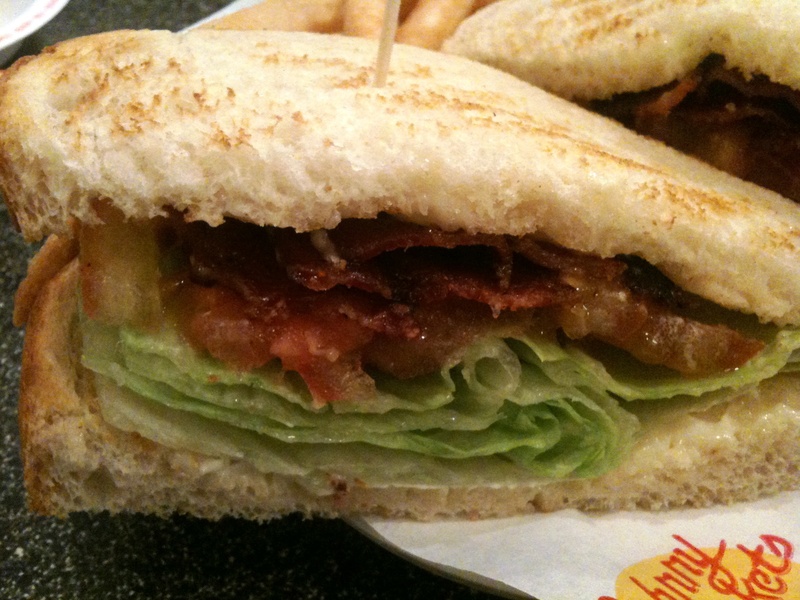 I decided that I wasn’t in a mood for a burger and opted for the BLT instead. The bread was nicely toasted and, while thickier than normal store-bought bread, wasn’t too much. The amount of bacon was perfect to get the flavor of it in each bite. The tomatoes were juicy and the (Romaine?) lettuce was chopped which made for a slightly messy sandwich. Instead of mayo, The Counter uses garlic aoli which definitely is tastier. The next day, Tanya and her man got hitched at the courthouse (CONGRATULATIONS!!!) and we all, along with other friends, celebrated with dinner and drinks at Tompkins Square in Westchester. Last night, Husband and I ate at our local Johnny Rockets. Once again, I went for the BLT. 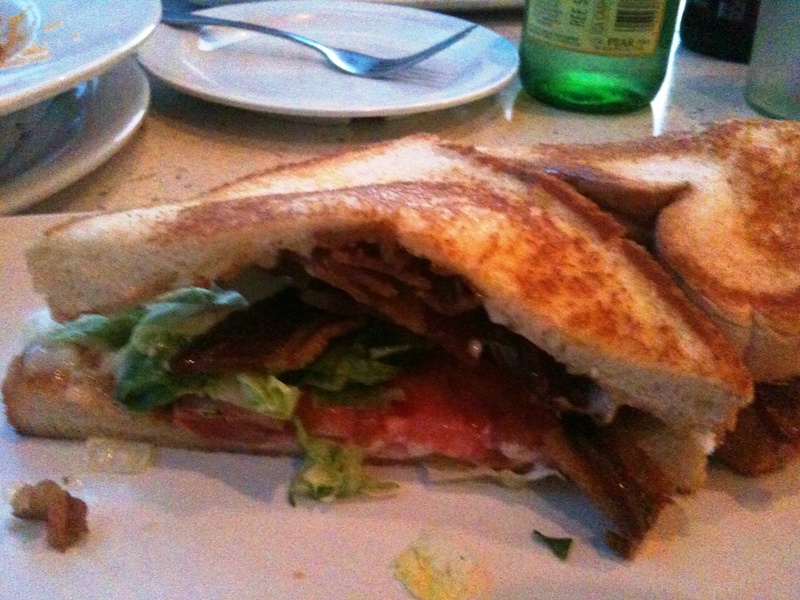 This was textbook – sourdough bread, bacon, iceburg lettuce, tomato and mayo. While it was good, it wasn’t really anything above average. And for the price…almost $9 (includes a side of fries), it seems a little overpriced. The Counter – El Segundo is rated 4 NOMs. Tompkins Square is at 4 NOMs, as well. Johnny Rockets is at 3 NOMs. Last October, Husband and I took a trip to the Big Island (Hawaii) to celebrate our first wedding anniversary. On our 2nd day (first day was recouping from the flight after an afternoon arrival), we drove to the East side to visit Hilo. I used to live here when I was a little kid and wanted to see how much had changed (or not) since I left. Due to a big breakfast and the fact we were going to a luau later that night, we didn’t want to fill up on a big lunch. Plus, the humidity was killing our appetites. Living in Southern California has spoiled me, apparently. I don’t remember Hilo being –that– humid but then again, it had been almost 20 years since I moved away. Anyways, I insisted we had to eat something “local”. I had no idea of where to go, though. The only places I remembered food-wise was a cafe next to the Woolworth’s at the mall and a small mom n’ pop market that served shaved ice. We weren’t a family that ate out a lot when I was a kid. Driving around the downtown area, Husband and I came across Cafe 100. I had seen this place featured on Guy Fieri’s “Diners, Drive-ins & Dives” show; they served up loco mocos and plate lunches. Perfect…local cuisine with things Husband would eat. Cafe 100 isn’t really a restaurant; it’s more like a stand. You walk up to a window, place your order and pick it up at another window. There are tables set up outside along the sides for people who want to eat there. 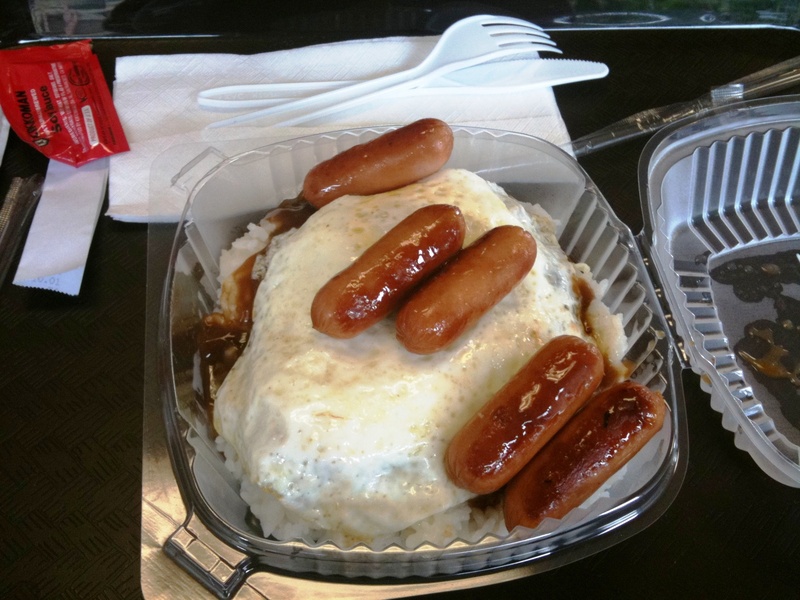 They were advertising a “Halloweenie” loco moco special (rice covered with gravy covered with a fried egg and topped with several pieces of small weenies). I had to do a little convincing to get Husband to agree to this as he was iffy about the combination. Gravy on rice…with egg? Trust me, it’s actually really good. This ended up being smaller than I expected but worked out perfectly as a snack split between the two of us. I would have liked more of a crisp edge on the egg but the yolk was nicely runny. A little more gravy would have been preferable as well since there wasn’t enough for all the rice. 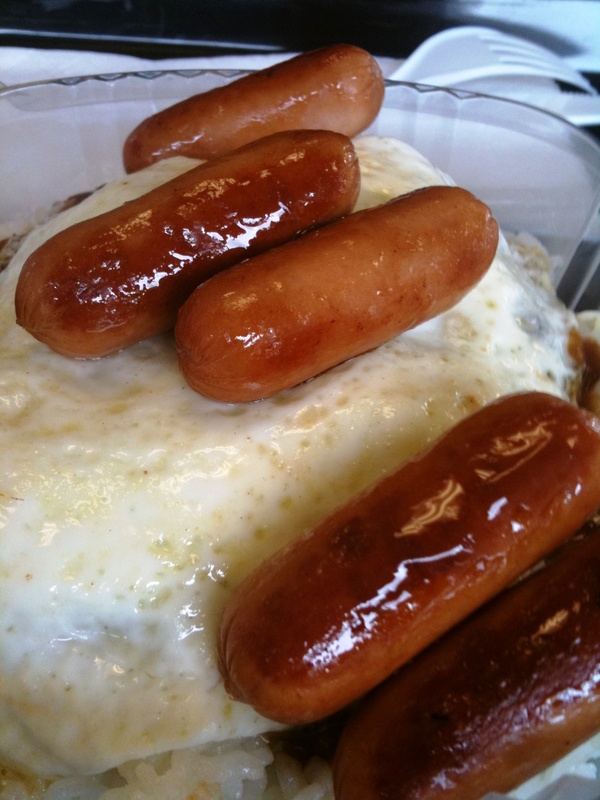 The weenies were plump and juicy. Taking a little bit of everything for each bite resulted in salty yumminess. However, the gravy alone was a little lacking in the salt so once we ate all the weenies and egg, the rice and gravy was a little bland. Husband was quickly won over by this dish, though. I wish we had more of an appetite because I would have loved to try their plate lunches and grab a Spam musubi. Oh well…next trip! The Husband and I ventured up to Sherman Oaks to have dinner and watch “The Wolfman” at the Arclight there with my wedding planner friend, Kristeen, and her husband. The movie wasn’t so great but dinner was! We decided to gnosh at Townhouse Kitchen & Bar at the Galleria. Since it was a Friday night, the place was packed so we had about a 1/2 hr wait. When we were seated, we started off with some cocktails and appetizers. I had the strawberry basil martini as well as the berry mojito, both specialty cocktails. 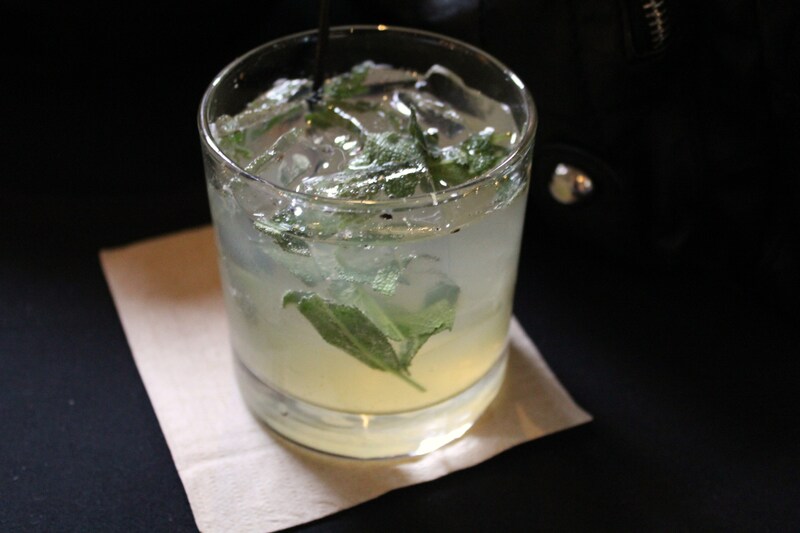 Sweet alcoholic goodness. Kristeen tried the fire & ice martini which had jalapeno in it…spicy! The four of us split devilled eggs ($5.99) and calamari ($9.99). 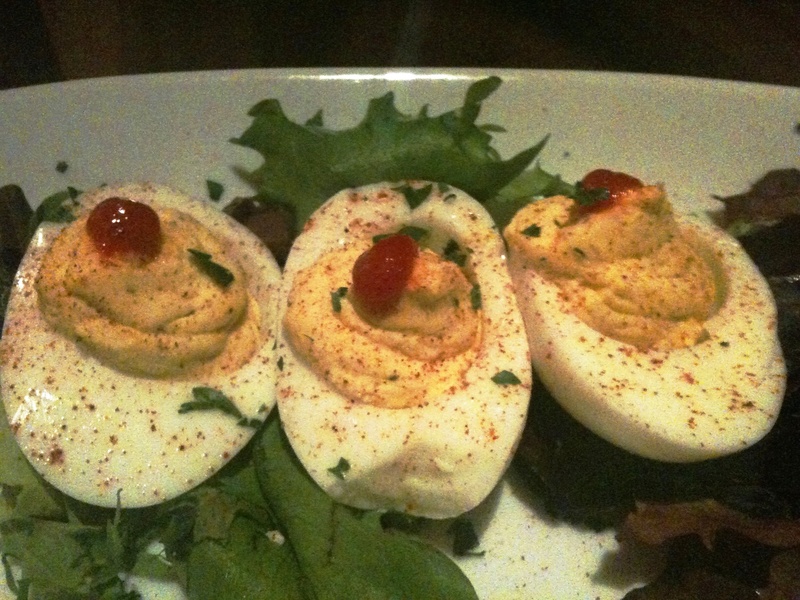 The eggs were good but nothing exciting or out of the ordinary…just your standard devilled eggs. The yolk was creamy and the touch of Sriracha sauce gave it some heat which I enjoyed. 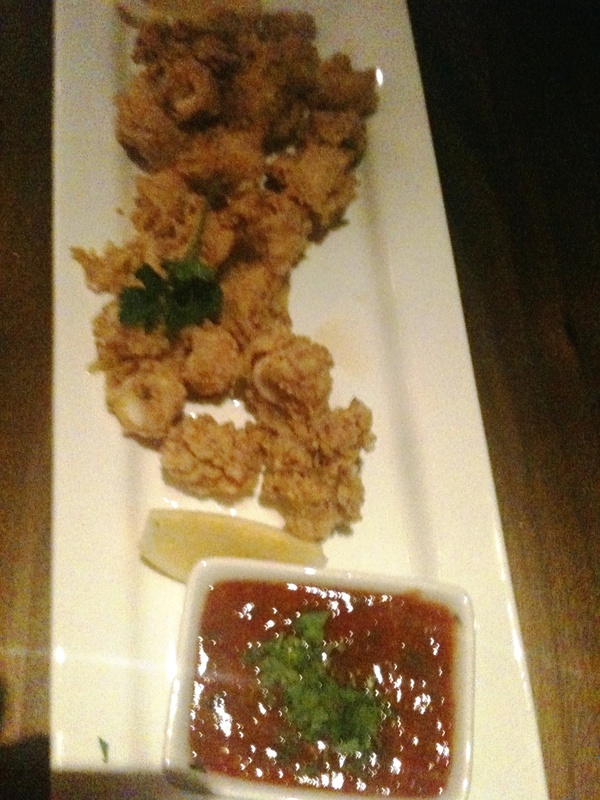 The calamari was nicely done – light crunchy batter, not overly oily and not overcooked. 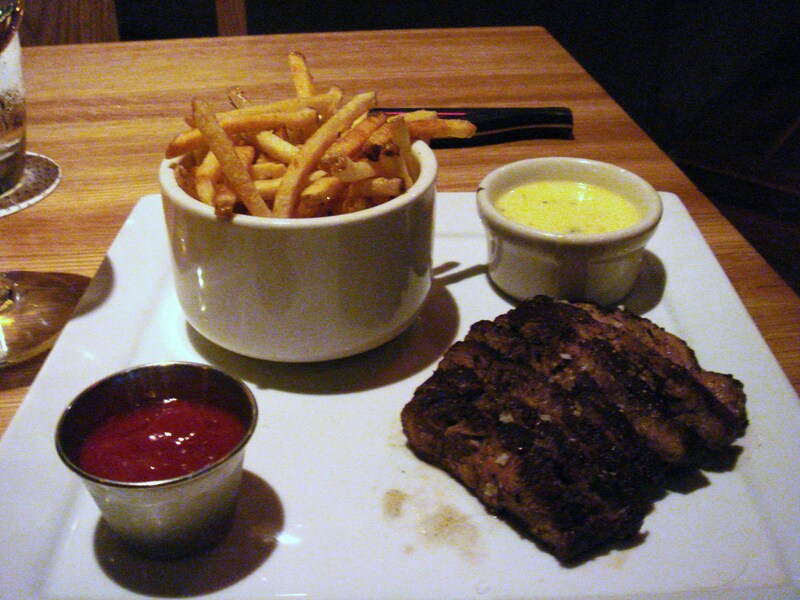 It was served with the standard cocktail sauce and a lemon caper habañero aoli sauce – spicy but a bit heavy. Combined with the fried coating, it was too much for me so I could only do little dabs. For our main course, the boys ended up ordering the lobster macaroni n’ cheese ($18.99) while the girls went with one of the specials – seafood risotto ($20something). I loved these dishes. The risotto was great – creamy, rich and just slightly “al dente”. The lobster wasn’t overcooked but it was a little hard to get out of the shell. 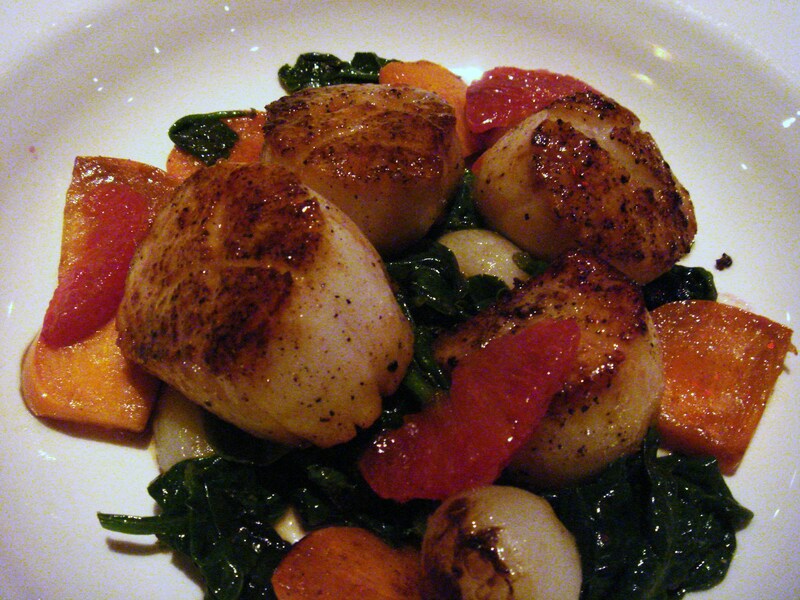 The scallops were wonderful – buttery and had a nice sear on them. 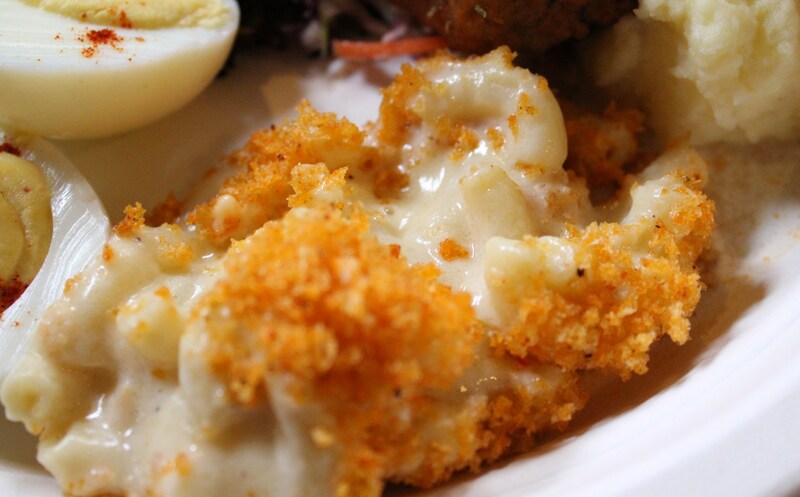 As for the lobster macaroni n’ cheese…om nom nom nom. A simple but excellent classic-style mac n’ cheese with only lobster to “gourmet” it up. I appreciated the use of shell pasta which was drowned in cheesy goodness. This was one of the better versions I’ve had so far in this town. We split the trio dessert sampler – chocolate bites, blondie sundae, fresh berries. I think I enjoyed the fresh berries the best with the whipped cream and chocolate shavings. The chocolate bites dessert was a rich delight while the blondie, a mix of yellow and chocolate cakes, was a good compromise for couples where one is not an avid chocolate fiend. We had an excellent server who was friendly, un-intrusive and attentive. Cost-wise, Townhouse is fair for the food quantity and quality. I think the only issue I had with the place was the lack of noise dampening. The place was full that night and it was pretty hard to hear each other over the din. Recently, I had to take a work trip down to my old stomping grounds of San Diego. While I was there, I decided that a stop at one of my favorite restaurants was necessary; it had been too long since I had been to Urban Solace. I called up my friend, “Chef” Eddie, and off we went for dinner. Located in the North Park area, Urban Solace opened its doors a few years ago. Since then, it has earned much acclaim for Chef Matt Gordon’s wonderful upscale twist on comfort food. Even though it was a weeknight, the restaurant was packed and there was about a 20 minute wait. For those who are faced with some extra time before being seated, a large bar area located near the door is a great place to hang out and have a pre-meal cocktail or have some wine or beer (bottled and tap) from the extensive list. 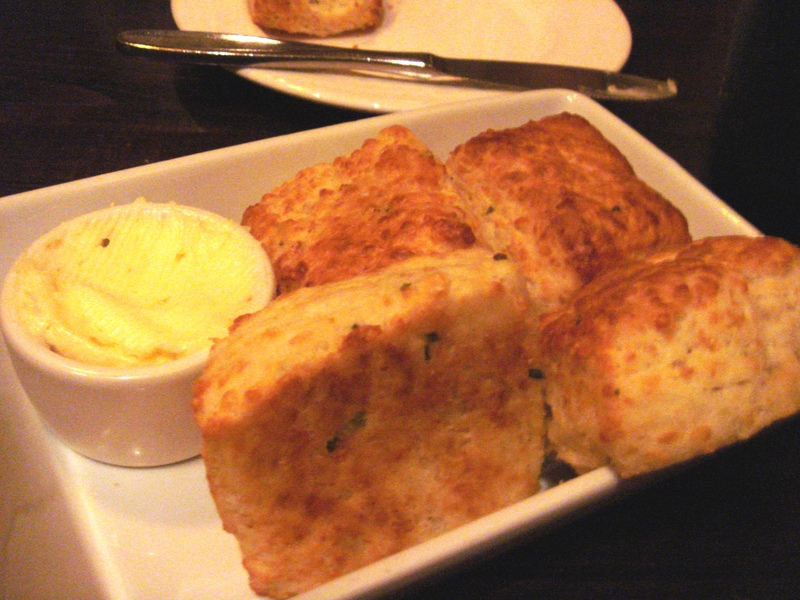 One thing that I always tell people they MUST order when eating at Urban Solace is the warm cheese biscuits with orange honey butter. Naturally, Eddie and I ordered some as an appetizer. Soft, fluffy, cheesy, these are the epitome of what cheddar biscuits should be. Paired with sweet citrus butteriness, it’s an interesting flavor contrast. I was craving veggies so I decided to get the spinach salad: baby spinach, goat cheese, warm sherry vinegrette, bacon, dates, hazelnuts. An excellent large salad, this was just what I wanted. 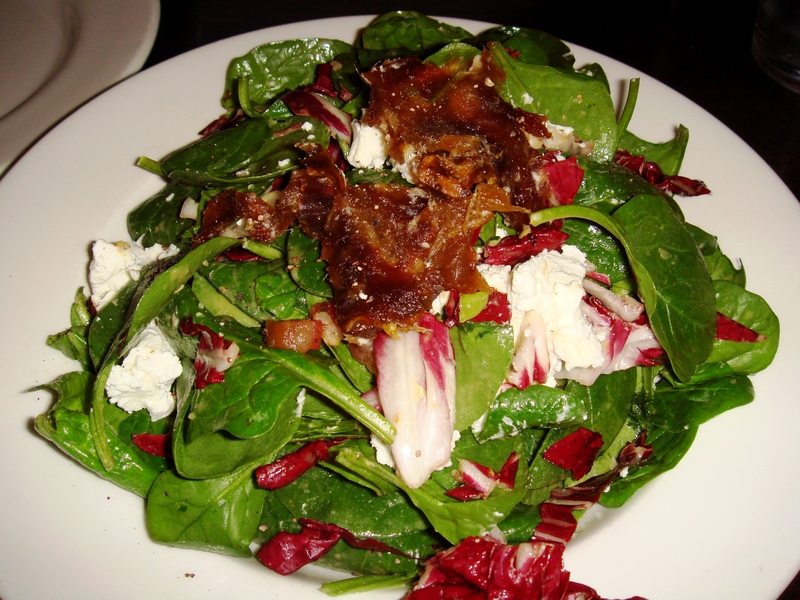 Healthy greens, meaty bacon for protein, hazelnuts for crunch, dates for a little sweetness…very well balanced. Maybe not the healthiest salad, but I did get my veggies! 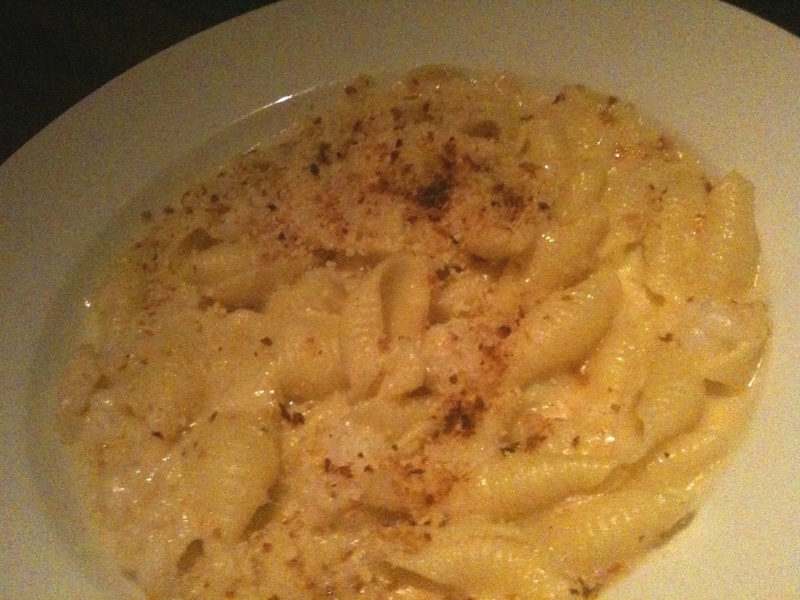 I also was craving mac n’ cheese and heard nothing but great things about the version Urban Solace serves. 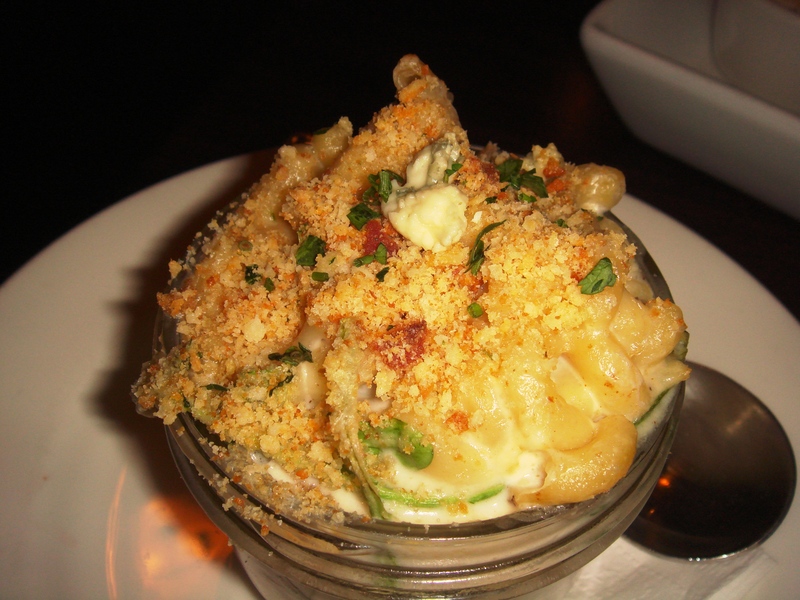 The duckaroni is a mac n’ cheese made with blue cheese, duck confit, roasted garlic, arugula, and scallions. You can order it as a side or as a main dish; I opted for the side since I had the salad. This was fantastic. There was a lot of cheese sauce which is a big thing for me as my main complaint for a mac n’ cheese is that it’s not cheesy enough. I loved the crumb topping. The blue cheese flavor was surprisingly mild. The duck was a great addition and the flavor just meshed well. I’m used to either some sort of shellfish, chicken or bacon/ham being in a mac n’ cheese but duck was a new one for me and I have to say, it was good. 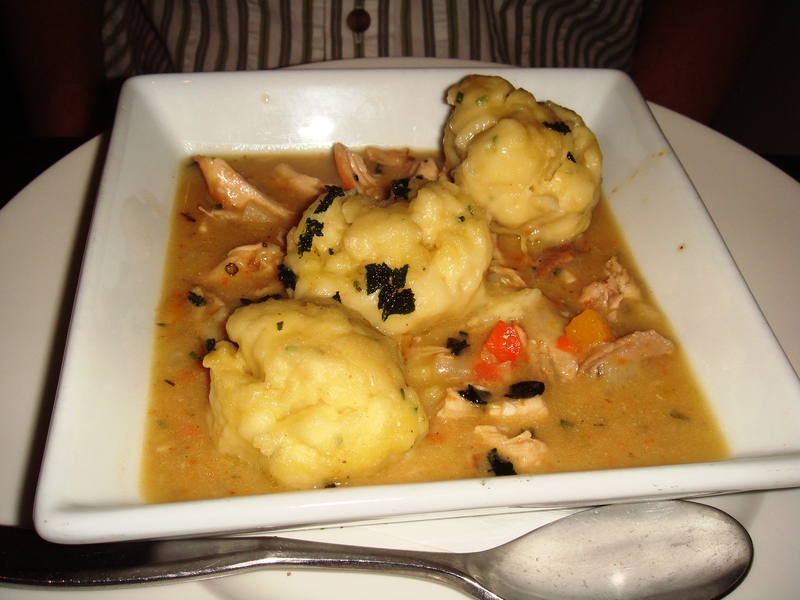 Eddie went with the chicken and dumplings and let me steal a couple of bites. This was excellent and very rich in chicken flavor. The dumplings weren’t overly dense and soaked in the sauce making for yummy bite after bite. He polished off his plate for the most part. We didn’t have room for dessert because all this food stuffed us silly; we even had biscuits leftover! All the times I have been here, the food has been spot on, both in flavor and execution. 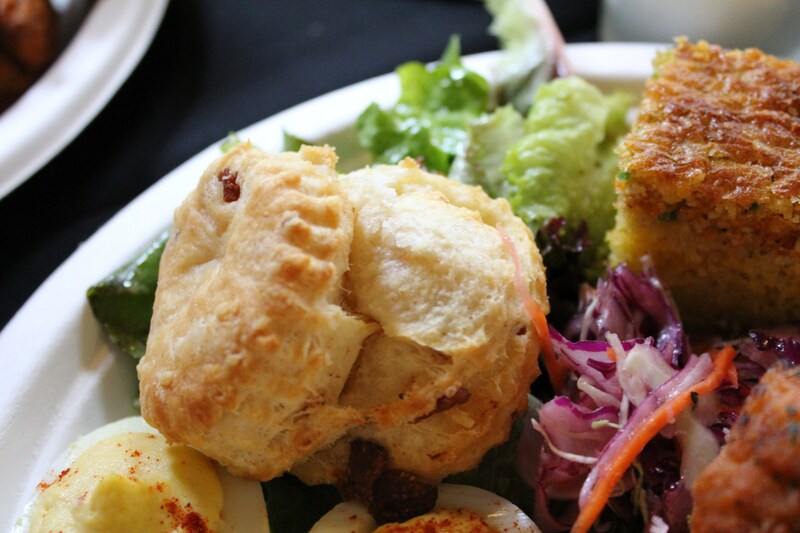 Consistency in deliciousness is just one of the reasons why Urban Solace finds itself on the list of San Diego’s best restaurants. The service is always friendly and excellent. As for the prices, I think they are not very expensive for the quality of dining experience you get. A few weeks ago, the Husband and I tried to make it to a free showing of “Up in the Air”. Unfortunately, we arrived too late to get a spot in line. Since we were already out and about, we opted for Westside Tavern for dinner since it was right there. Walking in, you get the feeling that the space is a swanky restaurant…a bit out of place considering you’re at a mall but then again, we are in Los Angeles. 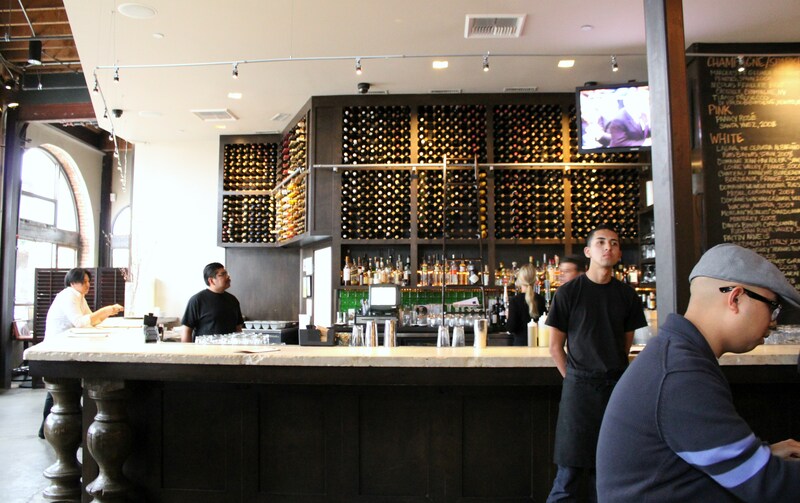 The restaurant is fairly large and has a spacious bar area with a large selection of alcohol and wines. Near where we were seated was a large chalkboard with the day’s specials. 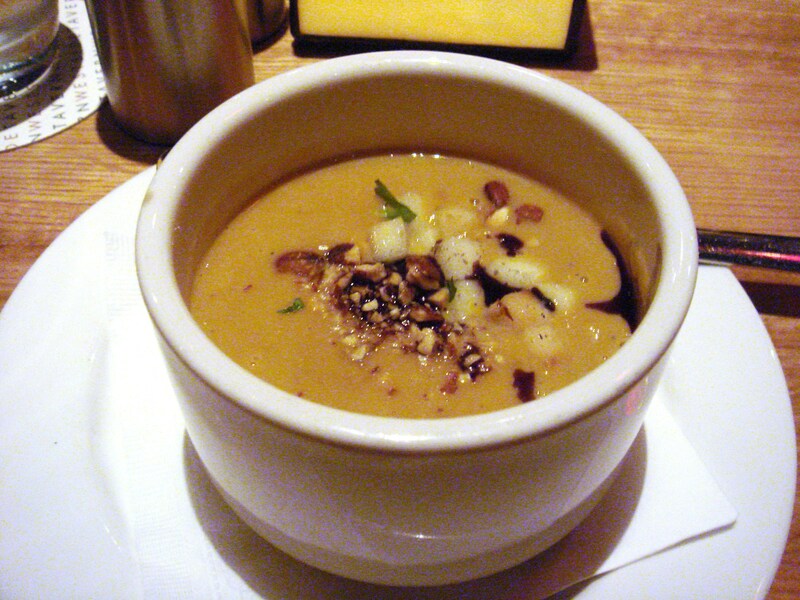 I noticed a butternut squash soup with almonds and pumpkin oil, and scallops with spinach, blood orange and persimmon listed. 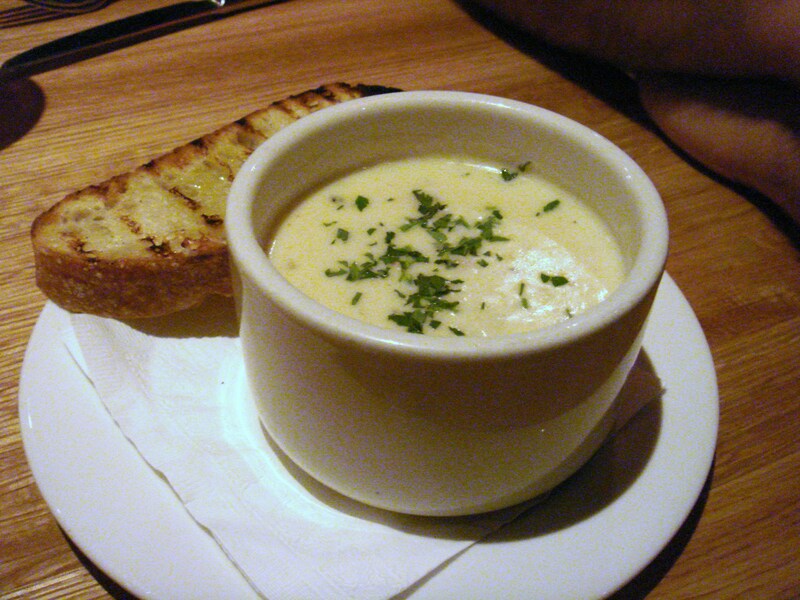 Both sounded enticing so I got a cup of the soup for an appetizer and the scallops as my main course. The husband ordered the clam chowder, another board special, and the Niman Ranch flat iron pepper steak with a Béarnaise sauce. The soup was amazing. The butternut squash flavor enhanced with the pumpkin oil and seasonings like nutmeg and cinnamon was simply rich and delicious. The almonds gave it a nice texture contrast. I couldn’t stop eating this and wanted more after I was done. This was a soup that is craveable. I hope that Westside Tavern adds this as a regular item one day. Or maybe I don’t… If they did, I’d be in trouble. The clam chowder was good with lots of chunks of clam. The only complaint my husband had was that it was a bit gritty, as if they didn’t wash the clams well enough. I agree; the bites I had all contained grit. Not pleasant and took away from the overall enjoyability of this dish. 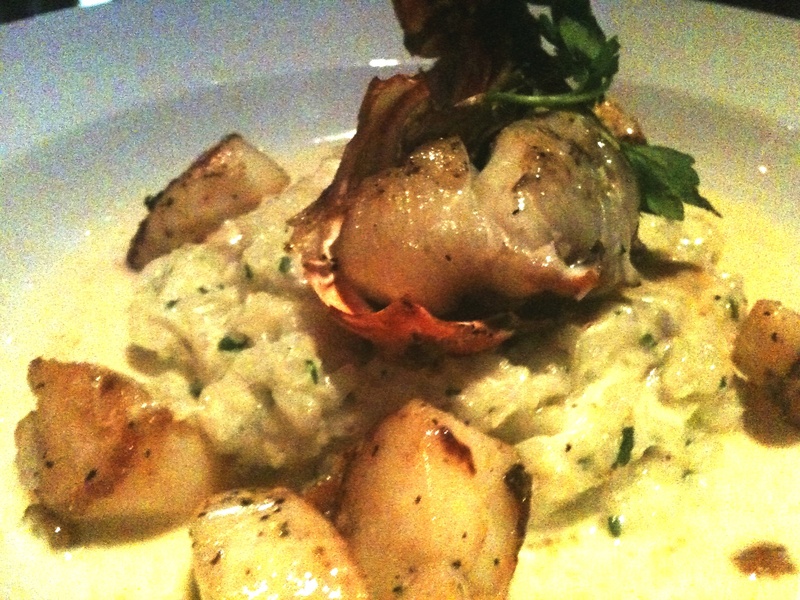 The scallops dish was great – nice sear and not rubbery (overcooked), with the exception of one of the scallops. The spinach was sauteed with garlic and packed a lot of flavor. The blood orange gave a nice citrus note and the persimmon a sweetness to each bite. Since this was our first time to Westside Tavern, my husband deemed it necessary to try a dessert in the interest of this blog. I think he just wanted an excuse for dessert. 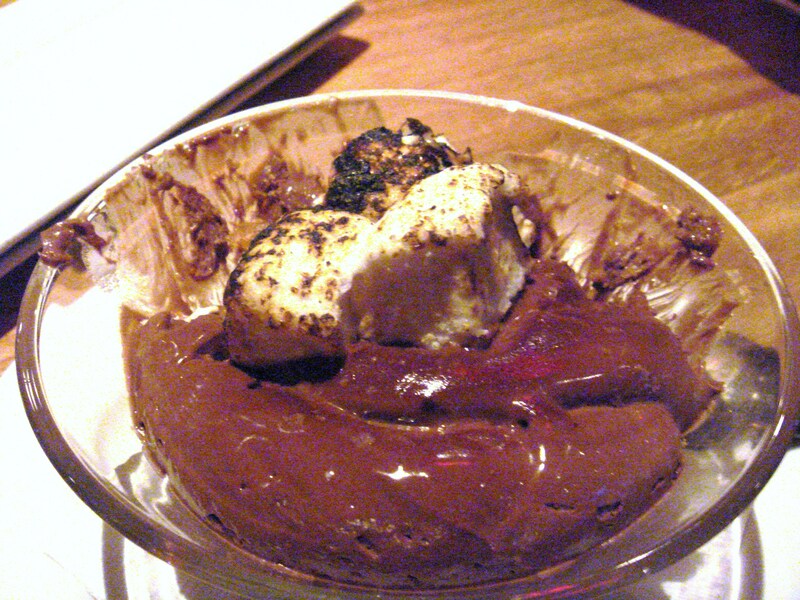 We decided on their S’mores Parfait – chocolate pudding with a crumb topping and toasted house-made marshmallows. This was really delicious and a nice ending to our meal. The crumb topping provided a nice crunch to offset the smooth and chocolate-y pudding. And the toasted marshmallows….mmmmmm. Our service was excellent. The prices were a bit high; dinner ended up costing us about $100 (tax and tip included) though we did have a carafe of wine with it. I would have to give Westside Tavern 3 1/2 NOMs for our first visit.